The article paints the Pope’s position as somewhat deistic. “God is more a clockmaker than a conjurer of miracles.” To hold this “clockmaker” concept of God one has to diminish the attributes of God. 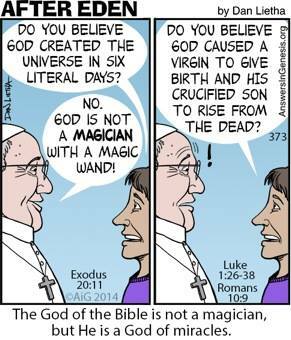 By stating that God is not “a magician, but the Creator who brought everything to life” the Pope seems to assume the stuff to bring to life already existed. If God is not a “conjurer” he did not create the world ex nihilo. A clockmaker merely assembles matter into an order that makes a clock work. He does not create the pieces of the clock. If God did not create (or conjure it from nothing like a magician would) the material to make the “clock,” where did it come from? Is matter eternal as God is eternal? That would lead to pantheism. We could then claim, as many do, to be gods ourselves because we are made of eternal matter. The conclusion then is if God is not divine, he is not God. 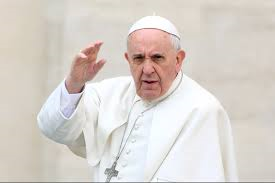 The second troubling point is that the Pope believes that the Word of God allows for theistic evolution. What is troubling about this position is that theistic evolution diminishes the nature and consequence of sin. Starting with the premise that there was no death before sin, and there is no sin before man, you cannot get death before man. If my premise is true, evolution is theologically contradictory to God’s Word because it presumes death before sin. (Evolution defined as a system of the fittest of a species living and the weakest dying through the millennia until you reach man.) If death is not a consequence of sin, what is the significance of sin? If sin is insignificant, God’s pronouncements against it are lies. If God is a liar, he is not God. The third issue from the article is directed at the atheistic argument that our understanding of the Big Bang “obviates a need to believe in a deity.” In fact, the converse of that is true: the Big Bang demands the existence of God. It is a simple syllogism: Something that begins to exist must have a cause. The universe began to exist. Therefore, the universe must have a cause. Edwin Hubble gave us evidence of an expanding universe. 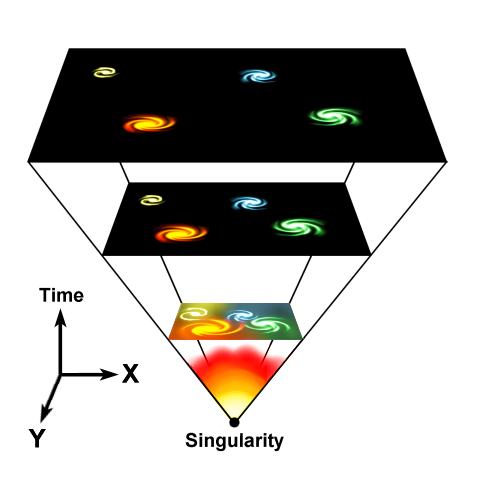 Because the universe is expanding, it must have had a starting point. If it had a starting point, it must have had a cause. That cause has to be transcendent and eternal in order to bring the universe into existence from nothing. This transcendent, eternal cause sounds a lot like the traditional Christian concept of God. If God is not transcendent and eternal, he is not God. This entry was posted in Christianity, Church and Science, Cosmological Argument and tagged Christianity, church and science on October 29, 2014 by DogTags. This blog post can be found at J.W. Wartick- “Always Have A Reason.” It discusses the Cosmological Argument for the existence of God. All knowledge requires a certain level of faith. A problem arises when faith is defined. A lot of people define faith like Pudd’nhead Wilson’s calendar did in Mark Twain’s Following the Equator: “Faith is believing what you know ain’t so.” New atheists jump on that definition. Sam Harris stated “Faith is the license religious people give themselves to keep believing when reasons fail.” Richard Dawkins said “The whole point of religious faith, its strength and chief glory, is that it does not depend on rational justification. The rest of us are expected to defend our prejudices.” However, what the Cosmological Argument demonstrates is that, logically speaking, anti-theism is not reasonable, or rationally justified. If we accept their definition of faith, the atheism of Sam Harris and Richard Dawkins requires more blind faith than the theism of their ignorant, little-old-church lady caricature. This entry was posted in Atheism, Cosmological Argument, Creation, Repost and tagged atheism, cosmology, evidence, faith, kalam, reason on February 17, 2014 by DogTags.